Patrick Bronte was born at Emdale, Drumballyroney, County Down, Ireland, the eldest of 10 children. Initially he was apprenticed to a blacksmith but his aptitude towards education which was mostly self taught, allowed him to pursue a university education. This was a significant achievement considering his father Hugh Brunty was an agricultural labourer and of modest financial means. In October 1802 Patrick Bronte aged 25 registered as a student at St John's College Cambridge. He corrected the spelling of his name from Brunty to Bronte. It is not known for certain why he did this, he may have wished to hide his humble origins. Why Bronte? He would have been familiar with classical Greek and may have chosen the name after the Greek mythological god "Bronte" which translates as "thunder". Another theory is that in 1799 King Ferdinand of Naples bestowed the honour of Duke of Bronte in Sicily to Lord Nelson for fighting off the French Navy. Patrick may have taken the name as respect of Lord Nelson. His time at college although financially difficult was successful, and as a scholar he was always in the top group academically. He was awarded Bachelor of Arts degree in April 1806. He was ordained into the Church of England in 1807 and took up a number of curacies. On 29th December 1812 Patrick Bronte married Maria Branwell at Guiseley Church. In 1814 Maria was born and 1815 Elizabeth was born. In 1815 he was appointed curate at Thornton in Bradford. 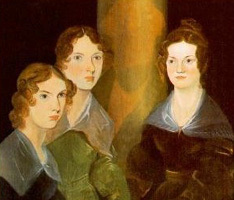 His three Daughters; Charlotte (1816), Emily (1818), Anne (1820) and his only son Branwell (1817) were all born there. In 1820 Patrick was appointed perpetual curate of Haworth. In January 1821 his wife Maria was diagnosed with cancer, and after a painful illness she died at Haworth on 15th September 1821. Maria's sister Elizabeth moved from Penzance to help Patrick out. Patrick found the strain of bringing up a family difficult and decided to send Maria, Elizabeth, Charlotte and Emily to the recently opened Clergy Daughters' School at Cowan Bridge. The harsh regime, cold and poor food took their toll on the children who were eventually taken away, however Maria and Elizabeth died soon after returning to Haworth. In 1847 Patrick campaigned strongly for improved education in the district and in 1849 for improvements in the water supply. A change in education and bad sanitation for local people was seen in his lifetime. On 30 October 1859 Patrick Bronte preached his last sermon from the pulpit of Haworth Church. On the 7th June 1861 he died aged 84. On the 12th June he was laid to rest in the family vault at Haworth church. He had lived and preached in the parish of Haworth for 41 years, outliving all his children.